I’ve been lying for the last ten years or so – however long those quizzes have been making their way around the internet that ask you “How many of the top 100 books have you read?” Because on every one, I’ve been saying that I had read The Bell Jar. I was sure that during that phase of my college life I had read Sylvia Plath’s infamous semi-memoir from the 60’s. However, another book I was reading earlier this year that went into detail about Plath’s novel made me realize that I hadn’t, and so I rectified this immediately – to great delight! I was so thrilled I took it to my book club as my highest recommendation, and it ended up being our September topic. The Bell Jar is the story of Esther Greenwood – a bright young woman of the 50’s and her dance with mental illness. 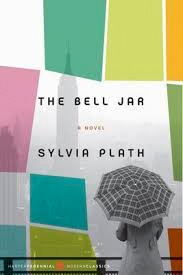 Those close to Plath – who committed suicide (famously, by putting her head in an oven) in 1963 – have indicated that The Bell Jar is largely autobiographical describing Plath’s years working for a magazine in New York and then struggling with the downward spiral of depression. A poet at heart, Plath’s turn of phrase demands recognition and creates a stark contrast between her beautiful language and the misery she’s describing. When The Bell Jar was published, it received little attention. Those who did take notice belittled it as chick-lit, no doubt taking their nod from Plath’s work for Mademoiselle. Calling The Bell Jar chick-lit forces a noticeable comparison to the type of novels that receive that label today and the sad decline of contemporary literature, for The Bell Jar is smart, introspective and complex. It lends itself to robust discussion that, for our book club, included both a detached view as a literary work and a reflection of personal experience. We had some who knew a lot about Plath’s personal life and those who knew little, and both views brought insight to the dialogue. We all agreed her descriptions of her treatment were both difficult and important. We also discussed the various metaphors of the bell jar; her relationships with the many men in her life; and portrayal of women, their options during this time period, and the sad hopelessness of limited options the narrator assumed was her future. I found it interesting to take note of all the crying spells she has during the narrative – when they happen & when they stop. Needless to say, this comes highly recommended for individuals or book clubs.